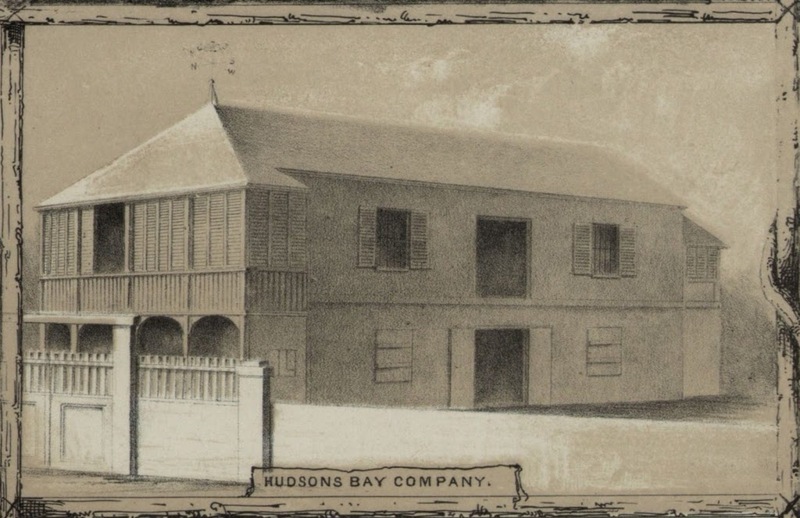 Hudson’s Bay Company (HBC) was a fur trading company that started in Canada in 1670; its first century of operation found HBC firmly focused in a few forts and posts around the shores of James and Hudson Bays, Central Canada. On January 21, 1829 the Hudson’s Bay Company schooner ‘Cadboro’ arrived at Honolulu from Fort Vancouver. While the HBC fur trade focused furs of beavers, sea otters, seals and other animals from the Pacific Northwest Coast and Alaska to be sold in China in exchange for tea, silks, porcelain and other Chinese goods, their interest in Hawaiʻi was to sell lumber and other goods, not furs. When the Hudson’s Bay Company entered the Hawaiian scene in 1829, Honolulu had already become a significant Pacific port of call and major provisioning station for trans-Pacific travelers. The earliest location of the Agency in Honolulu was on the north side of Nuʻuanu Street (between King and Merchant Streets,) where it occupied a two-story, shingle-sided building. In 1846 the Agency moved to a new site closer and more convenient to the waterfront at the corner of Fort and Queen Streets. They had a two-story coral building with slate roof, fronting on Queen Street, and one-story storage building along Fort Street. Thereafter, the location of their establishment became known as the “Beaver Block,” named after the HBC ‘mascot’ (and primary economic resource,) the beaver. As the year 1859 started, Pacific whaling entered its decline, HBC’s competition in the importation of goods increased. Janion Green and Co (forerunner of Theo H Davies), Hackfeld and Co (forerunner of Amfac,) C Brewer, and Castle and Cooke (the beginnings of the Big Five) were established firms. Instructed to wind up affairs in 1860, the last Company representative left Honolulu in March 1861. The Company’s old Fort and Queen business site, however, continued to be known as the Beaver Block. Other businesses moved into the premises. Twenty years passed, during them, Lunalilo ascended to the throne and died within a year; his estate took control of the property and their trustees sold it to James Campbell. 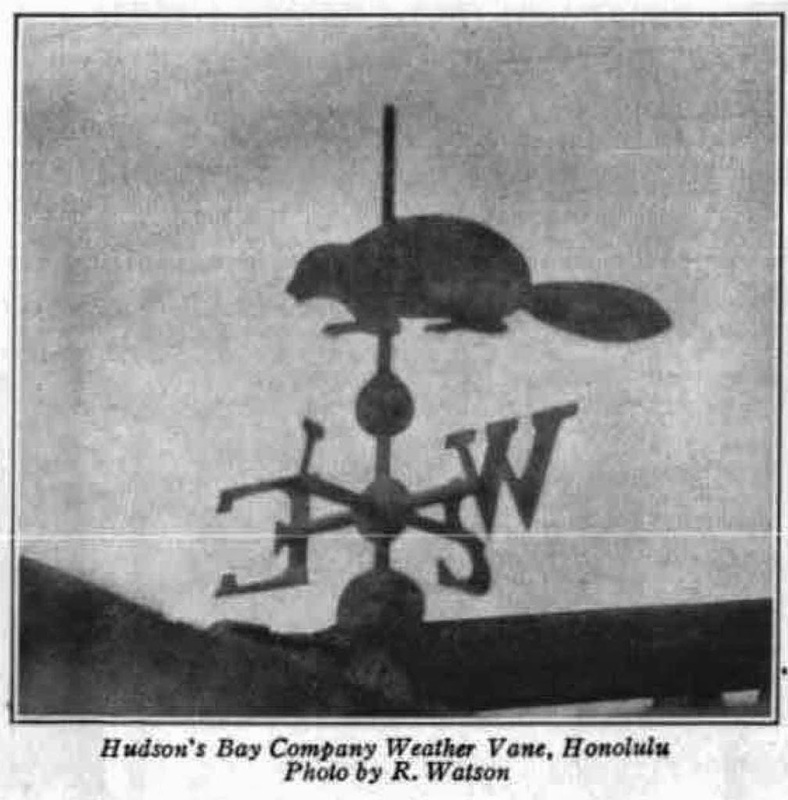 In 1882, Campbell built a new building and put the old iron beaver weathervane of the Hudson’s Bay Company on its roof – affirming the Beaver Block tradition. Beaver Block was a large building that included uses such as storage, shops and offices that stretched along Fort Street and Queen. That year, Campbell, who owned the adjacent land (fronting Fort and Merchant Streets) built the “Campbell Block,” a similarly-large building that included uses such as storage, shops and offices. A notable Beaver Block tenant was GW MacFarlane & Co, shipping and general wholesale merchants. George W. MacFarlane was born in Honolulu in 1849. He got a job with Theo Davies in 1868 and stayed with the firm until 1876. McFarlane became a prominent attendant to King Kalākaua and merchant in Honolulu during the 1870s-1880s. He was also associated with Spreckels and other financiers in sugar interests. He died in 1921. Plans called for a combined office and parking structure to replace the 2-story on Fort and Merchants Streets; this new building was considered an important part of the redevelopment of downtown Honolulu. (Adamson) The Beaver Block and Campbell Block buildings were torn down and a new building was completed in May 1967. The image shows the Beaver Block weathervane (The Beaver.) In addition, I have added other related images in a folder of like name in the Photos section on my Facebook and Google+ pages. Within ten years after Captain Cook’s 1778 contact with Hawai‘i, the islands became a favorite port of call in the trade with China. The fur traders and merchant ships crossing the Pacific needed to replenish food supplies and water. The maritime fur trade focused on acquiring furs of sea otters, seals and other animals from the Pacific Northwest Coast and Alaska. The furs were mostly sold in China in exchange for tea, silks, porcelain and other Chinese goods, which were then sold in Europe and the United States. Needing supplies in their journey, the traders soon realized they could economically barter for provisions in Hawai‘i; for instance any type of iron, a common nail, chisel or knife, could fetch far more fresh fruit meat and water than a large sum of money would in other ports. After acquiring the “Louisiana Purchase” in 1803, under the directive of President Thomas Jefferson, the Lewis and Clark Expedition, also known as the “Corps of Discovery Expedition” (1804–1806), was the first transcontinental expedition to the Pacific coast undertaken by the United States. Fur traders working for the HBC traveled an area of more than 700,000 square miles that stretched from Russian Alaska to Mexican California and from the Rocky Mountains to the Pacific Ocean. Ships sailed from London around Cape Horn around South America and then to forts and posts along the Pacific Coast via the Hawaiian Islands. Trappers crossing overland faced a journey of 2,000 miles that took three months. On January 21, 1829 the Hudson’s Bay Company schooner ‘Cadboro’ arrived at Honolulu from Fort Vancouver with a small shipment of poles and sawn lumber. The Company was attracted to Hawaiʻi not for furs but as a potential market for the products of the Company’s posts in the Pacific Northwest. That first trip was intended to test the market for HBC’s primary products, salmon and lumber. Another goal of the trip was to recruit Hawaiians for HBC operations on the Northwest Coast. As early as 1811, HBC had already hired twelve Hawaiians on three year contracts to work for them in the Pacific Northwest. By 1824, HBC employed thirty-five Hawaiians west of the Rocky Mountains. It is estimated that by 1844 between 300 and 400 Hawaiians were in HBC service in the Pacific Northwest, both in vessels and at posts. When the Hudson’s Bay Company entered the Hawaiian market in 1829, Honolulu had already become a significant Pacific port of call and major provisioning station for trans-Pacific travelers. In addition to the sale of Northwest Coast products, the Company’s Honolulu Agency in the 1840s entered into the merchandising of English manufactured goods. HBC was always considered a leading Honolulu merchant house, but what really distinguished it was its continuity. In those days Honolulu business firms other than HBC were either sole proprietorships or partnerships, which were easily formed and as readily dissolved. HBC was stable and strong and based outside of Hawaiʻi. The Company’s Honolulu customers were both the whaling fleet and local businesses, and individuals, including the Hawaiian population – all of whom appreciated the high quality of the products the Company offered for sale. The Company’s role in Honolulu’s merchant shipping forms a considerable chapter in Hawaiian maritime history; shipping was the lifeline of the Agency. Company cargo, with only a few exceptions, was transported in vessels owned or chartered by the Company. Each year a Company vessel carrying trade goods and supplies was sent from England around Cape Horn to the Northwest Coast, usually stopping at Honolulu. As the year 1859 started, Pacific whaling entered its decline, the Agency’s competition in the importation of goods increased. Janion Green and Co. (forerunner of Theo H. Davies), Hackfeld and Co. (forerunner of Amfac,) C. Brewer, and Castle and Cooke (the beginnings of the Big Five) were established firms. The Honolulu market was overstocked with goods, and trade was slow. In 1859, HBC decided to close its Hawaiʻi operations; a couple years later, they were gone. The image shows an 1853 drawing of the Hudson’s Bay Company building in Honolulu. In addition, I have included other images in a folder of like name in the Photos section on my Facebook and Google+ pages.